1. First of all sprinkle chicken breasts lightly with salt and pepper. Next is to grill or broil until no longer pink. Cube cooked chicken. 2. And then prepare broccoli according to package directions, and drain well. 3. Prepare spaghetti according to package directions. Drain well. 4. Process garlic cloves with garlic press, and combine with olive oil. 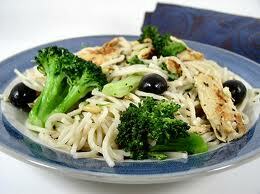 Toss pasta with chicken, broccoli, and garlic/oil combination. Season with salt and pepper to taste. Sprinkle with grated Parmesan cheese. Enjoy the chicken spaghetti ! Nice !